Best soccer clubs in the world today. Best Soccer Clubs that we love and follow week in, week out. This part of my website will be reserved for the top soccer clubs in the world. I am excited to get started on doing research and putting together the list for best soccer teams in the world, past and present. If you love soccer, than you must have a favorite soccer team for which you are very passionate about. The list for great soccer clubs is quite long with teams from Europe, South America, USA and other parts of the world. Soccer nowadays brings a smile to many kids and peoples faces, as the game grows to #1 sport in every corner of the world. Some countries are still a little behind in soccer development, USA being one of them, however soccer is like an epidemic and keeps growing faster and faster in all countries still catching up to all the soccer hype. Without a doubt, every country is catching up to this sport, and I am sure that in the near future soccer will become the #1 sport in every part of the world. Fans have made this game more interesting, while the technology has made soccer a multibillion dollar industry. Best Soccer Clubs around the World spend millions of dollars every year bringing new and well known players into the club. This attracts more fans eager to see top soccer players in their favorite team uniform. Player salary is one major part of this game that grew drastically over the past 20 years, allowing professional players life of luxury through multimillion dollar deals for their soccer skills. 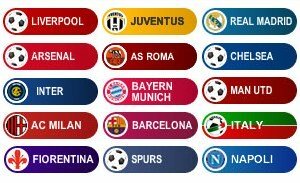 Here is a few of the most famous soccer clubs in the world; Chelsea, Manchester United, Manchester City, Liverpool, Arsenal, AC Milan, Inter Milan, Juventus, Barcelona, Real Madrid, Santos, Boca Juniors and many more. Real Madrid is believed to have the highest amount of revenue and profit, than any other soccer club. Because of this, some people believe that Real Madrid is the MOST popular soccer club in the world. No matter which way you look at it, every soccer club has a fan base who follow their team in different leagues. Soccer Clubs in Europe and around the world usually have a nickname for their fans. Just to name a few, Manchester United fans are called Red Devils, Liverpool fans are called The Red Army, Barcelona fans are called Culés and Real Madrid fans are called Madridistas. Fans make this game more fun, and the more fans that show interest in any club, the more success and money that club tends to attract. World soccer teams give us entertainment, and without the fans to support the game, soccer would not be where it is today. Browse through different teams listed below and come back to visit my webpage regularly.